It is a day to commemorate the members of the armed forces, to honour the fallen, and remember all those who served to defend our Nation. Many lives were lost, injured, psychologically traumatized and forever changed. As a peace keeping nation, we strive toward a future without war. Poppies are worn as a symbol of respect and support for all those who served. Originally, lapel poppies were made by disabled Canadian veterans, but since 1996 they have been commercially manufactured. They are worn on the left lapel, generally from the last Friday in October to the end of the day on November 11th , after which they should be placed at a memorial for veterans. Many of us have been fortunate enough to have never experienced war and the suffering it causes. The least we can do is acknowledge and commemorate. A heartfelt thank you to all those who have served and to all those who have been affected. 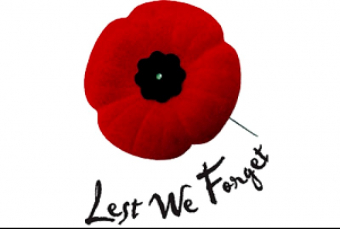 The famous poem titled In Flanders Fields is recited at Remembrance Day Services. It was first published in December 1915 and was written by Lieutenant John McCrae, a teacher and military doctor who served in World War 1.